One hundred and six years later from its tender beginnings as an Edwardian wooden yacht, commissioned in it’s design by members of the Royal Norfolk & Suffolk Yacht Club to comfortably sail both on the local rivers and the inshore waters off Lowestoft, the Broads One Design Yacht has encountered a total rejuvenation of the fleet, attracting interest from far and wide since acceptance of a fibreglass version in the late eighties. The Broads One Design Yacht was designed by Linton Hope, Naval Architect to the King of the Belgians, at the end of the nineteenth century. It is understood that it may now be the oldest class in the UK and second oldest in the world. The original lines and rig have remained nearly unaltered since its inception and are a true testament to this graceful, beautiful-to-sail and much admired yacht. Polyester sails replace the original cotton ones and the hull and deck are now generally constructed in glass fibre instead of wood. Escalating in number from a mere thirty one of the original version built between 1900 and 1939, the fifty-first glass one (No.82) is currently under construction. Twenty seven of the original thirty one remain. 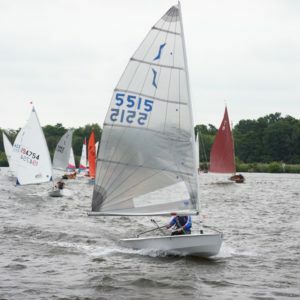 While Waveney & Oulton Broad Yacht Club has only seen a steady increase in the number of new Broads One Designs, the fleet at Wroxham under the flag of the Norfolk Broads Yacht Club has significantly increased. There exists, however, a fair exchange in class racing by the passionate and more competitive members of the two clubs, with the Royal Norfolk & Suffolk Yacht Club reaping support as the fleet’s parent club during the months of June, July and August by offering some contrasting sailing at sea. It is then that the true versatility of the Broads One Design Yacht is so clearly evident. Although some owners may purchase their yachts for cruising only, the main encouragement is for racing and within a wide range of members sailing ability, the class is pleased to boast some exceptionally talented helms. Indeed there are many keenly contested races throughout the summer season of this strict one design class. A friendly and pleasant social life off the water prevails, however, throughout the year! A thirst for travelling has developed in recent years with visits abroad to Holland and Germany having taken place, as well as to the Yacht’s original place of build at Burnham on Crouch to compete in their Annual Regatta. Other venues on the agenda are France and Italy, with Antigua even having been considered. Last year an invitation to class members was received from the Nainital Yacht Club in India, who likewise has a fleet of yachts deigned by Linton Hope, and to where an adventurous group of sixteen travelled, albeit on this occasion without their beloved “Brown Boat”. The early years of the class are not fully documented, but it does have a set of rules dating back to 1905 and a Minute Book commenced in 1911, which provides for some very interesting recording of events over the years. 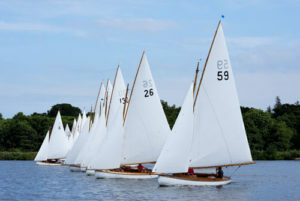 It is known for instance that the first yachts were delivered from Burnham on Crouch on flat bed railway trucks laid on their side and that the first race was held in 1901 on Whit Monday on Oulton Broad. Our current Archivists have been keenly researching further and collating any available information – they would be delighted to receive any other knowledge or memorabilia. The Broads One Design, affectionately referred to as the Brown Boat and now also as the BOD, is without doubt, as Charles Goodey wrote in his book in 1972, a fleet of racing yachts unique in Great Britain – if not the world. The Star is one of the most prolific keelboats in the world for a reason – simple, it is an incredible boat to sail. It has proven to be a classic in every sense since it was designed in 1911 by Francis Sweisguth. Having first been used in competition in 1932 and still at the heart of competition today it is the oldest Olympic class. Supported by a world-wide association the Star as a class is one of the best organized in sailing with over 8500 yachts built over 100 years. Many of the worlds top sailors past and present have been involved with the Star Class which is made up of a variety of sailors of all ages and skill levels and some will say that ‘one race on a Star has hooked some sailors for life – IT’S A THRILL’. The first of a new class of Norfolk One-Designs – a £65 racing dinghy – was built in 1931 by Mr Herbert Woods of Potter Heigham as a protest against the price of the 14ft International Class which was soaring to 150 guineas. The boats soon proved their worth, although they quickly attracted the attention not only of young people but also of crack helmsmen, which, while disheartening to the new hands, set a high standard of sailing which the younger school were able to emulate. Proof of their growing popularity was the commissioning of six or seven new Norfolk’s each year until the commencement of war, and they continued to be made at this rate from 1947 until 1951, with ten new ones in 1949. One change, however, has been forced upon the class since the war, and this was the replacement of bamboo with hollowed spruce for spars and masts, due to the impossibility of obtaining suitable bamboo. But there is still a few bamboo masts to be seen, as well as plenty of gaffs and booms. The boats were built of African mahogany; clench built, copper fastened, with gunter rig, no spinnaker being allowed, and even no forestay or battens. The “B” on the sail rather than “N” for Norfolk’s is confusing until one remembers that the 12 foot Nationals, which were sailed frequently on these waters inter-war, display the letter “N”. Therefore “B” for Broads was chosen. The year 1981 saw the celebration of the Golden Jubilee of one of the ‘founder member’ classes of our Club, the Norfolk Dinghy. The first race held by the class was on Easter Monday 1931 and was from Potter Heigham to Hickling Broad and back. Six of the seven boats built took part and W.L Clabburn’s Swift was first over both legs. The fiftieth anniversary was therefore celebrated by a repetition of that race on Easter Monday 1981. This time no fewer than 44 boats took part – an all-time record. The Optimist was born in 1947 in Clearwater, Florida. The Clearwater Optimist Club wanted to do something for the children of the community, and a number of members pushed around the idea of promoting soapbox derby cars. This idea turned out to be a non-starter because Clearwater has no hills, a fatal deficiency for a program involving vehicles powered solely by gravity. It was then pointed out by other members that while the Gulf Coast city was poor in land features it was rich with water and suggested sailboat racing instead. They asked a local boat builder named Clark Mills to come up with a children’s boat simple enough to build at a cost no more than $50. Mills sketched a sprit-rigged pram that was 7ft 8′ long, the maximum length he could get out of an 8ft length of plywood. It took a day and a half to build and was called the Optimist Pram. It was a boat which a young skipper and a parent could put together in a garage, with one sheet of plywood, some stainless steel screws, some resorcinol glue, and a few banged thumbs. Plans were sold for $2.50 and a fleet of the Optimists were soon sailing on Clearwater Bay. The Optimist was mainly a Florida phenomenon when a serendipitous development set the boat on a course to become the most truly international of all international classes. A Danish, tall ship captain by the name of Axel Damgaard to the Optimist to Denmark in 1958 will Mills’ permission. It was in Denmark that the rig was slightly modified and the boat was renamed the International Optimist Dinghy and the class soon spread across Europe. In 1962, the first World Championships were held, at Hamble in the UK. The class received International status from the sailing world’s governing body, the International Yacht Racing Union (now ISAF) in 1973. It was during the 1970’s that the popularity of the Optimist spread to Asia, Africa and Latin America. The Optimist today is one of the world’s largest and fastest growing sailing classes, bigger than Lasers, Hobies or any other one-design. While many boats claim ‘International’ in their title, there is none which is sailed in more countries. The Optimist may be the world’s only true ‘International’ dinghy. The history of Yachting architecture on the Norfolk Broads is a remarkable one. Throughout the 19th Century the waterways of Norfolk and North Suffolk were a breeding ground for experimental design, and radical excursion. Although some innovation was in the course of commerce, most was in the pursuit of speed and sport. 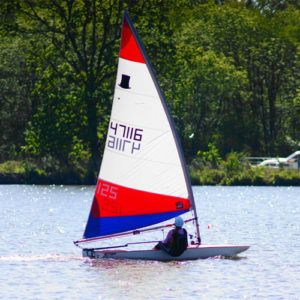 From the late 1700s and perhaps earlier, sailboat racing was to the waterside communities of Wroxham, Stalham, Yarmouth and Lowestoft, a popular public sport. The best analogies today are soccer and horseracing. Whilst pursued by the few, they are followed by many. 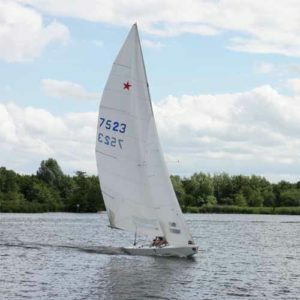 So it was with sailing races on the Broads. Betting was rife, and leading yachts and skippers were fiercely supported by rival sections in various communities. There are strong indications that Broads Yacht Racing began to evolve a more formal structure in the late Napoleonic period. With Britain forced to maintain a large (defensive) army, and much of that force billeted in coastal Britain, there was little for the officer class of such regiments to do other than wait for Bonaparte’s long threatened invasion. In this limbo of phoney war, sport provided a needful diversion and in Norfolk the wetlands made racing yachts a better prospect than Steeple Chasing. The survival of cabin yachting today, as encapsulated in the River Cruiser Class, owes everything to these early days and one or two subsequent milestones in history. Although commercial craft were adapted for this growing sport, the first pure Broads racing yachts to emerge were almost certainly the small, heavy, lateen and gaff two masted racers of the period 1815 onwards, of which the Paragon (later Maria) is the most famous survivor. By the mid 19th Century these 19-25 ft, flush-decked hybrids were superseded by slightly larger cutters, of pure gaff rig, but minus the usual dual headsails, which were combined in one large jib. By removing the heavy lateen pole mast from the stem of the boat, the chest (or Cod’s Head), could be drawn finer, with subsequent easier entry. Counters began to evolve in this period in a bid to ‘cheat’ the current rating rule of measurement on the ram, attracting the attention of rating/handicap pioneers like Dixon Kemp, However the big boost to Broads cabin yacht design came, nor from the racing fraternity, but from an entirely different direction. By the 1870s, Broadland was no longer a well-kept secret. Various yachting and sporting periodicals were extolling its virtues and leisure attractions, and the coming of the railways meant convenient access, but the emergence of a new form of leisure industry demanded the catalyst of a visionary. Wroxham provided one in boat builder John Loynes, who in 1878 opened the first hire yacht yard, catering to Victorian gentleman tourists. Others followed suit and the Broads boating industry was born. The low freeboard of the flush-decked inland waterways yachts offered little prospect for holiday accommodation so cabins sprouted, doghouse style, from the decks. Lifting coach roofs with ingenious mechanisms effected luxury (for the time) accommodation and if there was not room in the forepeak for the hired professional crew, he camped in a tent on the riverbank. Today’s River Cruiser Class is largely made up of the survivors of the hire yacht industry and a number of custom-built Victorian and post-war (first and second) racers. To these have been added the produce of a variety of approved moulds, producing new craft of modern GRP hull construction. Each year, additions are built, some even in wood! And today there are nearly 390 listed; a unique collection of specialist inland waterway cruising and racing yachts, quite unlike any other to be found in the world. The National Solo is a classic, one-design, single handed dinghy. Designed by Jack Holt in 1956. Originally designed in wood, boats are now also available in Foam Reinforced Plastic or composite construction (FRP hull and wood deck). The light double-chined hull has inward sloping decks that make the boat comfortable for the crew when sitting out. While quite lively the Solo dinghy is not as physically demanding as a Laser, or many of the other single crew designs and developments in rig technology mean that it can be sailed competitively by helms from nine and a half to sixteen stones. The Simple and Sensational Topper. 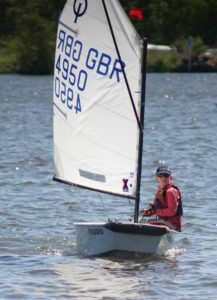 Whether just messing around, having fun off the beach, learning to sail or competitive racing all are just a few reasons for choosing the fantastic Topper. The Topper was designed by Ian Proctor who also designed the ever popular Wayfarer. After well over 20 years of production and approximately 50,000 boats it is its outstanding build quality and durability that has made the Topper one of the most popular boats in Britain. In 1977 the Topper was awarded the Design Council Award and the Horner Award for achievements in plastics. The Topper has been recognised as an R.Y.A Junior Development class and is part of the R.Y.A Performance Pathway that could one day lead to a place in the British Olympic Team. The friendly class – this reputation is well earned both by the sailors themselves and the shore-side parents and supporters. 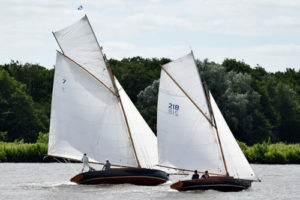 The first Yare and Bure One-Design was built in 1908 and remains one of the finest keelboat classes in East Anglia, despite passing its Centenary year. One of the Broads’ most prolific designers of the twentieth century was Ernest Woods of Cantley (and later Horning), who was the creator of the Yare and Bure. 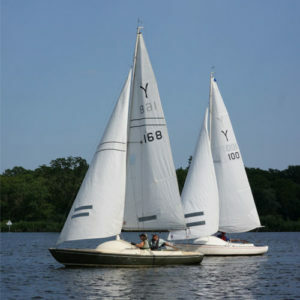 It resulted from a competition to establish a One-Design Class held by the Yare and Bure Sailing Club. Ernest Woods built 6 boats in 1908 and went on to build a total of 69 boats. Herbert Woods (Nephew of Ernest) became the class builder when Ernest passed away and built his first boat No. 70 in 1963. Herbert Woods built a total of 24 boats until the cost of building in wood became prohibitive. In 1981 a fibreglass mould was taken from one of the early Ernest built boats and the current class builder Kingsley Farrington introduced the first GRP boat, YBOD No. 94. Ernest Woods’ original moulds are still owned by the class so there is no reason if your pocket is deep enough why you couldn’t have a wooden one built today. The Yare and Bure Class Committee decided in 2005, that the time was right to commission its own mould and several of these new boats are already on the water. Over 140 YBOD’s have been built to date. Some of these have been lost over the years in boatyard fires for example, but many of the originals are still sailing today and also as successfully as the day they first went on the water. 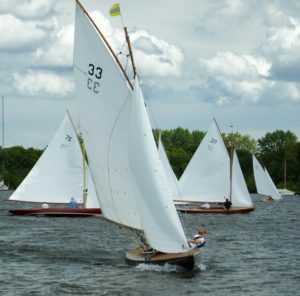 The YBOD has a reputation for providing the best racing on the broad, and it is that reputation that has attracted many owners to the Class. During conversations with Leslie Landamore after we bought No. 18 (Cameo) from him in late autumn 1972, I understood that it all started when a friend of his named Ernest Yeoman’s, asked Leslie to design a keel boat, about the size of a “White Boat” (Yare & Bure one design) but in fibreglass, for low maintenance costs, which he could sail single-handed if need be (within 10 minutes of arriving at the Club), do a bit of racing with Allcomers A, and perhaps camp in it, if he felt inclined: in other words a general purpose sailing craft. Number 1, Zircon, was built in wood and from this the original moulds were produced. I believe they still exist. I first saw Yeoman’s racing on Wroxham Broad during the summer 1972, and when my friend Bertie Wooster said he could not find a White Boat in decent condition at a price he could afford, I said, (off the cuff as it were) how about sharing a Yeoman with me. No, he said. I do not like plastic boats. So that was that. However, a week or so later he phoned me to say my suggestion was not a bad idea and we should investigate. At that stage Leslie had two for sale. No.4 Topaz (His original idea was to have them all named after gem stones) and No. 18 Cameo which he had used as a demonstration boat in several parts of the country. He gave us new floor boards and fitted a forward buoyancy tank at cost. At Queen Mary Sailing Club much of their racing takes place during the winter months and the enthusiasts there drove their boats so hard that frequent gear failures occurred. I remember Leslie saying that if had he been asked to design a racing boat for those weather conditions it would have been different in many respects from the Yeoman’s we were using on Wroxham Broad. However, modifications were made, running gear strengthened where necessary, and the Class remained in good shape. I cannot remember the exact date, but a bit later two further changes were made. The high aspect Genoa, of the same area, made tacking much easier and the second, a centre winch designed and fitted by John Murphy in Quest 2 in about 1984. This had two great advantages: the crew could sit to windward but a more important feature – it stiffened the boat so that the lee shrouds did not sag. 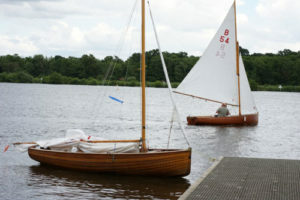 Following the sad demise of Plain Sailing and the difficulties David Moore had, the moulds went back to Landamore’s, and since then Betts Mouldings at Rackheath have become the official builders (under licence from Landamore’s) and many modifications have been introduced, such as spinnaker chutes, and all inboard wood being replaced by fibreglass. In 2005, the new 3000 series was introduced and have been racing on Wroxham Broad.